My conversion, April 5, 1854, while kneeling at the mourners' bench in the College chapel during a revival, and while engaged in earnest, agonizing prayer, was bright and unmistakeable. The transition from darkness into light, from condemnation into conscious peace and acceptance with God was sudden and attended with ecstatic joy. At once I became missionary in spirit and began pleading with the unsaved to share with me this blessed experience of conscious salvation. Such conversion experiences were the norm for 19th century Methodists. As a matter of fact, revivals were designed to produce such an experience. Naturally some converts were unable to translate the emotional intensity of the revival into a lifetime of Christian service as John McLean did, but numerous autobiographies attest to the power of revivals to transform lives. attendance at the annual meeting at which a theme in Texas UM history is examined from a variety of viewpoints. The 2007 meeting considered church controversies. The 2008 meeting, to be held in Austin, will consider the theme, "The 40th Anniversary of Abolition of the Central Jurisdiction." The TUMHS Newsletter that keeps you informed of Texas UM opportunities, new publications, workshops, etc. Last week's column highlighted the career of Rev. I. G. John as editor of the Texas Christian Advocate from 1866 to 1884. One feature of John's editorship was his encouraging his readers to send postal cards which he would print in a column titled Postal Notes. Most of the contributors were preachers who told about revivals, protracted meetings, and quarterly conferences. The Notes were also liberally sprinkled with information about the weather, crops, marriages, and deaths. Here is a sample from the last week of March, 1879. Bandera, Bandera Co., Thirty-one joined the cold water army here, forty at Centre Point. Gonzales, Gonzales Co., Our quarterly meeting for Leesville Circuit embraced last Sunday, had a good time. Bro. Keith is faithful and is doing good service, but is poorly paid. Boston, Bowie Co., Have just returned from Dekalb where I held a two day meeting. DeKalb is a "hard place." Infidelity is exercising a baneful influence over the rising generation there. Card playing, drinking, pistol-shooting, and other vices are being carried out on the sabbath. W. W. Horner. A man described by historian Macum Phelan as "for many years the most prominent man of the conference" died on March 17, 1897. That man was the Rev. Isaac Griffin John whose promience in Texas Methodism was due in large part to his editorship of the Texas Christian Advocate from 1866 to 1884. 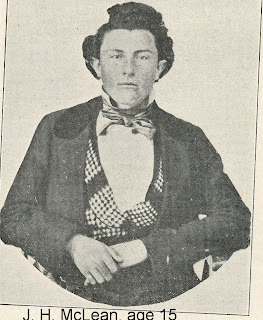 John was born in Indiana in 1827 and moved to Galveston while still a youth. He was licensed to preach in 1847 and served a variety of appointments including Richmond, Washington, Bastrop, Lockhart and presiding elder of the Austin, Waco, and LaGrange Districts. His greatest challenge came during Reconstruction when the General Conference of 1866 named him editor of the Texas Christian Advocate. That publication of the MECS had almost gone out of business during the Civil War. The presses had been relocated inland from Galveston to Houston for safety, but the shortage of paper and declining circulation almost killed it. John's immediate predecessor as editor, the Rev. H. V. Philpott, lasted only five months. The editorship was not a full time job so John continued to serve appointments around Galveston. He was able to avoid bankruptcy. He increased the Advocate to eight pages and waged subscription campaigns by enlisting preachers as subscription agents. Unfortunately the increased number of pages often included large sections borrowed from other newspapers, both religious and secular. They also included fillers of personal information, oddities, and John's long winded and pointless editorials. As circulation increased the Advocate became more attractive to advertisers. By the 1880's the Advocate had signficant advertising, much of it from Galveston merchants, but also from patent medicine vendors. Even though the editorial quality declined, the circulation increased from less than 1,000 to 10,500 in 1884 when John stepped down as editor and was appointed to Huntsville. John's leaving the Advocate produced a special event in Texas Methodist history. While waiting for the Rev. George W. Briggs to take over as editor, Homer Thrall edited a special 16-page edition of the Advocate on the history of Texas Methodism. That edition had a press run of 100,000 copies, an immense effort to the era. John did not stay in Huntsville very long. 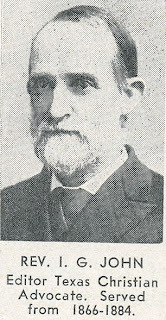 The 1886 General Conference named him secretary of the Board of Missions. He moved to Nashville where he spent the rest of his life editing and writing publications for the Board of Missions. He died in Nashville, and his body was returned to Georgetown, Texas for burial. We are building a brick church--we thought that wood would not do so well as the lumber you know that our lumber do not last well. It does not stand the weather. We got the brick furnished and laid for $1100; the carpenters do their work for $1125. The lumber, then the painting, glazing, plastering &c. Can't you get down and give us a dedication sermon? You need not be in a hurry. It will be some time before the church is built, and you know how tardily these things move along. The Methodists were meeting in the Odd Fellows Hall. The Roman Catholics and Presbyterians already had buildings in Houston. Construction continued through 1843. Bishop James O. Andrew came through Houston in December, 1843 on his way to Robinson's Settlement in Walker County to hold annual conference. He noted then "the Methodists have a very neat brick chapel, nearly finished." He went on to comment on the state of religion in Houston. ". . .there is a great need for a sweeping revival of religion in Houston; for in addition to the usual evil influences exerted against what is holy, they have here more of infidelity, subtle, organized and boldly blasphemous, than I have met in any place of its size, in all my journeying." Bishop Andrew, accompanied by Summers and a layman named Charles Shearn, continued on to Robinson's. At the close of conference, Andrew took Summers back to Alabama with him. The "little brick chapel" eventually changed its name to Shearn Methodist Church and eventually became First Methodist Houston. Summers' letter to Fowler is preserved at Bridwell Library, SMU. During the first half of the 19th century Methodist circuit riders established a reputation for pushing to the very limits of settlement--no matter what the dangers. One famous story from the period relates how a Methodist preacher was greeted with these words when he came upon a family that had just staked a land claim, "I left my last farm to get away from the Methodists, and now you're here before I get my wagon unpacked! You may as well baptize me. I can't get away from the Methodists." Joseph P. Sneed kept that reputation intact by going all the way to Fort Milam, about four miles from present-day Marlin, in 1840. Sneed had volunteered for the Texas Mission, and been appointed to the Nashville Circuit. (Nashville was in present-day Milam County near Gause. It was the headquarters of the Robertson Colony, and was county seat of Milam County at the time Sneed was there.) Sneed's circuit embraced twelve preaching points north from Yegua Creek to the settlements along the Brazos, Little Brazos, and Navasota Rivers. The region was sparsely populated and a dangerous place for travelers. Only four years had passed since the famous Comanche raid on Fort Parker within the bounds of the circuit. Sneed's journal entry for March 4, 1840 reads (in part)"We kept guard all night to keep from being surprised by Indians. The wolves howled around us, but I slept very soundly, waking but seldom. The Lord preserved us and the next day we reached Fort Milam five miles from the Falls of the Brazos where I preached at night from Mat. 4:17." Thomas A. Morris, the bishop who had appointed Sneed to the Texas Mission wrote Littleton Fowler a letter of introduction, "We have sent you Brother Sneed, a man who is not afraid to die or to sleep in the woods." Sneed did survive the rigors of circuit riding in the Republic. He died at the age of 77 at his son's farm in Milam County and is buried there.